Irving Herrera creates wonderful images of beautiful woman. 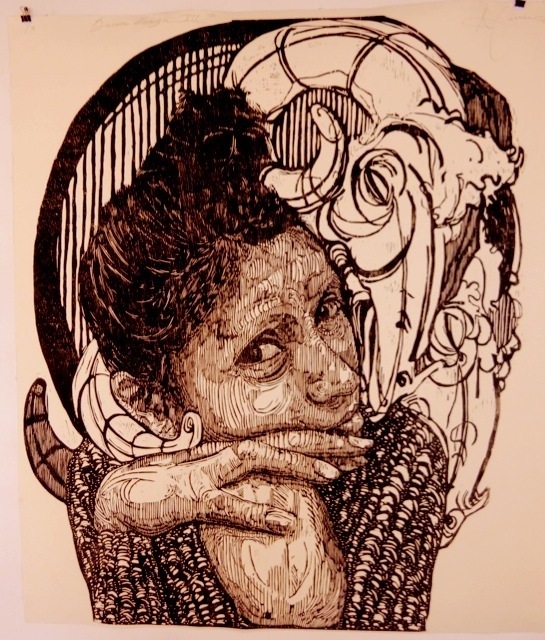 What is so remarkable about his artwork is that he appreciates the beauty of the indigenous and mixed-race woman of Oaxaca. Throughout Mexico the leggy newscasters you see on T.V. and the models on billboards, calendars, and magazines often look like pure-blooded Europeans. 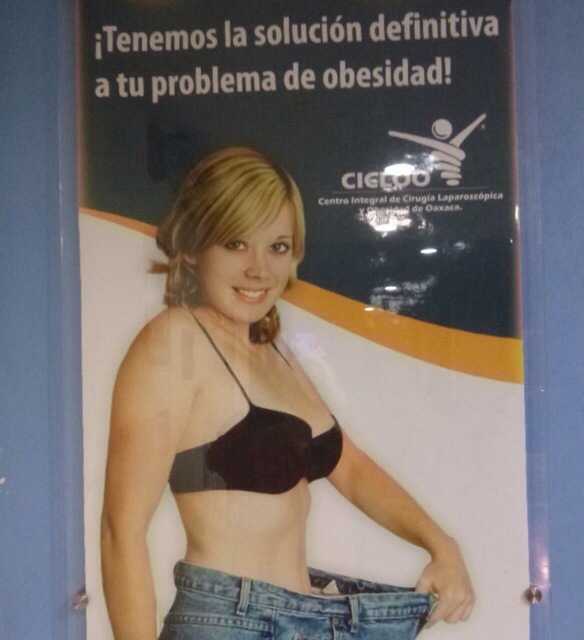 I took a walk looking for examples and found this mind-boggling image in the lobby of a liposuction clinic. Such images of so-called ‘female perfection’ bombard the men and women of Oaxaca daily. Dark, broadbodied Indigenous women might play the sympathetic maids, but not the love interest in telanovelas (soap operas.) Irving was born to an indigenous Mixteco family in the high mountain village of Huajuapan de Leon in 1984. 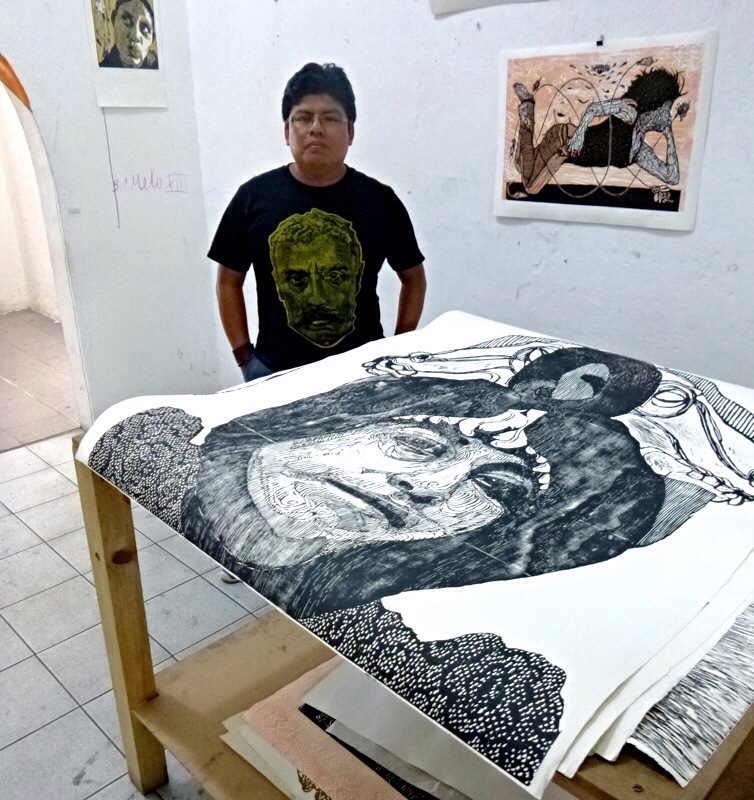 He came to Oaxaca and studied with the master printmaker Shinzaburo Takeda. He told me he carves these portraits from models directly into the wood in a matter of hours. Then he crowns the portrait with the bones of a slaugthered animal, often a goat. The senoras’ seductive expressions are jarringly juxtapozed with the formal posture and dress of the Porfiato (Mexico’s version of Victorian era.) 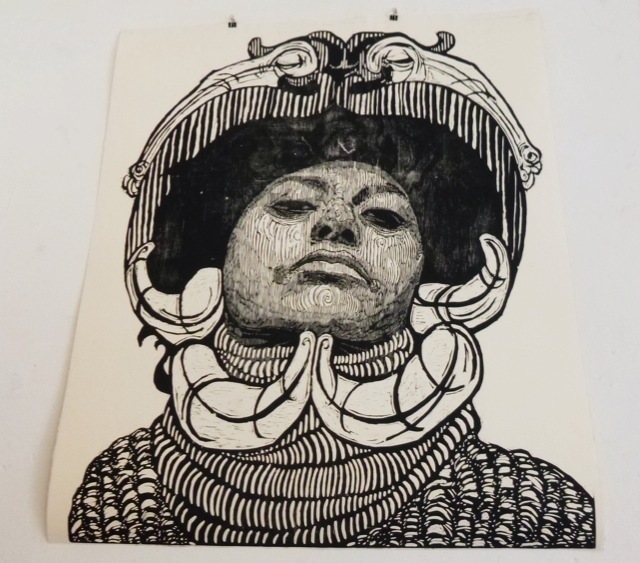 Irving says he’s mixing memories from the slaughterhouses of his boyhood town and the prints of Jose Guadalupe Posada. This past weekend Irving travelled into the mountains accompanied by his beloved teacher Maestro Takeda. The two artists were honored guests at a regional festival in Irving’s pueblo, Huajuapan de Leon, were the woman are so very beautiful. 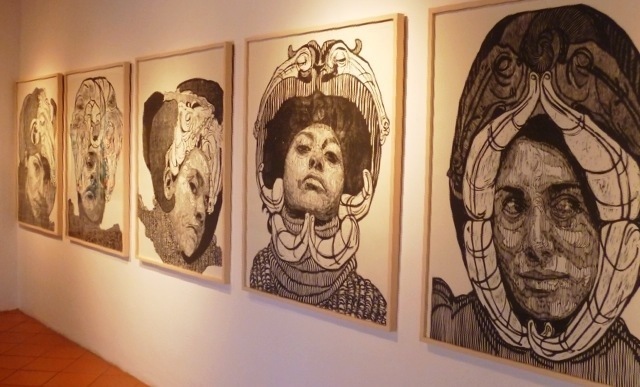 In Oaxaca, Irving Herrera and his talented companeros of Gabinete Grafico studio can be found at 307 Xincotencatl. Next > Nils Balls and The Ship of Soiled Doves. size? are they for sale? price? The compositions and the position of the ladies’ heads for this Nouveau fan boy bring echos of Mucha and Klimt. They are 10 cm more than a meter wide. about 4 feet tall by 3 wide. Best Galleries in Oaxaca have them ,including Gallery 910. I will be down again in Jan, maybe I can get one for you. Kevin, This is really incredible work. Thanks for posting! Is there any chance he’d like to visit Kutztown? Hi Evan, I will ask him.